An airfoil is a structure designed to obtain reaction upon its surface from the air through which it moves or that moves past such a structure. Air acts in various ways when submitted to different pressures and velocities; but this discussion is confined to the parts of an aircraft that a pilot is most concerned with in flight—namely, the airfoils designed to produce lift. 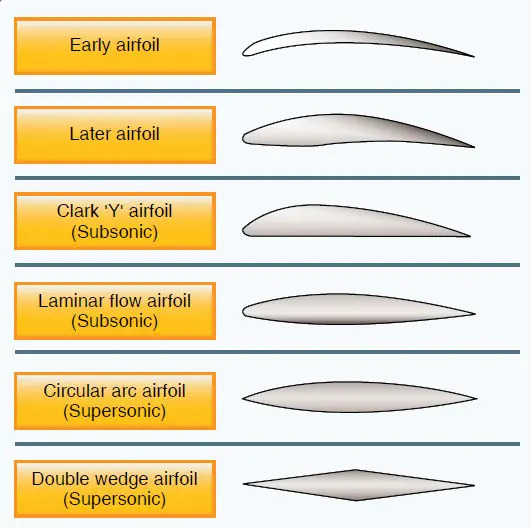 By looking at a typical airfoil profile, such as the cross section of a wing, one can see several obvious characteristics of design. [Figure 4-5] Notice that there is a difference in the curvatures (called cambers) of the upper and lower surfaces of the airfoil. The camber of the upper surface is more pronounced than that of the lower surface, which is usually somewhat flat. Figure 4-5. Typical airfoil section. NOTE: The two extremities of the airfoil profile also differ in appearance. The rounded end, which faces forward in flight, is called the leading edge; the other end, the trailing edge, is quite narrow and tapered. 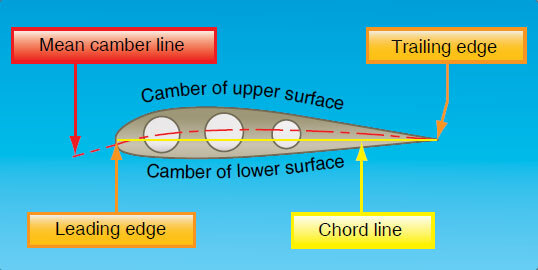 A reference line often used in discussing the airfoil is the chord line, a straight line drawn through the profile connecting the extremities of the leading and trailing edges. The distance from this chord line to the upper and lower surfaces of the wing denotes the magnitude of the upper and lower camber at any point. Another reference line, drawn from the leading edge to the trailing edge, is the mean camber line. This mean line is equidistant at all points from the upper and lower surfaces. An airfoil is constructed in such a way that its shape takes advantage of the air’s response to certain physical laws. This develops two actions from the air mass: a positive pressure lifting action from the air mass below the wing, and a negative pressure lifting action from lowered pressure above the wing. If all the lift required were obtained merely from the deflection of air by the lower surface of the wing, an aircraft would only need a flat wing like a kite. However, the balance of the lift needed to support the aircraft comes from the flow of air above the wing. Herein lies the key to flight. It is neither accurate nor useful to assign specific values to the percentage of lift generated by the upper surface of an airfoil versus that generated by the lower surface. These are not constant values. They vary, not only with flight conditions, but also with different wing designs. Different airfoils have different flight characteristics. Many thousands of airfoils have been tested in wind tunnels and in actual flight, but no one airfoil has been found that satisfies every flight requirement. The weight, speed, and purpose of each aircraft dictate the shape of its airfoil. The most efficient airfoil for producing the greatest lift is one that has a concave or “scooped out” lower surface. As a fixed design, this type of airfoil sacrifices too much speed while producing lift and is not suitable for high-speed flight. Advancements in engineering have made it possible for today’s high-speed jets to take advantage of the concave airfoil’s high lift characteristics. Leading edge (Kreuger) flaps and trailing edge (Fowler) flaps, when extended from the basic wing structure, literally change the airfoil shape into the classic concave form, thereby generating much greater lift during slow flight conditions. On the other hand, an airfoil that is perfectly streamlined and offers little wind resistance sometimes does not have enough lifting power to take the airplane off the ground. Thus, modern airplanes have airfoils that strike a medium between extremes in design. The shape varies according to the needs of the airplane for which it is designed. Figure 4-6 shows some of the more common airfoil designs. In a wind tunnel or in flight, an airfoil is simply a streamlined object inserted into a moving stream of air. If the airfoil profile were in the shape of a teardrop, the speed and the pressure changes of the air passing over the top and bottom would be the same on both sides. But if the teardrop shaped airfoil were cut in half lengthwise, a form resembling the basic airfoil (wing) section would result. If the airfoil were then inclined so the airflow strikes it at an angle, the air moving over the upper surface would be forced to move faster than the air moving along the bottom of the airfoil. This increased velocity reduces the pressure above the airfoil. Applying Bernoulli’s Principle of Pressure, the increase in the speed of the air across the top of an airfoil produces a drop in pressure. This lowered pressure is a component of total lift. The pressure difference between the upper and lower surface of a wing alone does not account for the total lift force produced.